This will be the last game to be played in the Round of 16 stages; we already have six-quarter-finalists with the seventh one being selected from the match between Spain and Italy to be played today. Wales, Poland, Portugal, Germany, France, and Belgium have qualified for the next round. 28th June 2016 at 23:45 (IST). England has been good in this tournament till now, and they still have a very long road ahead. They have a complete pass rate of 89% with 1316 passes out of 1476 concluded by them with an average possession of 60% and an accuracy of 85%. They have had three goals in the three games till now out of the 43 shots they have had on the goal with an accuracy of 34%. Daniel Sturridge, Jamie Vardy, and Eric Dier have all scored one goal each for the team and are the joint top scorer for them. The team is excellent and talented, but their coach still doesn’t know the best playing XI. He doesn’t know who to play upfront, whether Harry Kane or Jamie Vardy or in the wing whether Raheem Sterling or Sturridge and this could be fatal for the team as they cannot risk any other slip ups. They drew two, against Russia by 1-1 and against Slovakia by 0-0 and won against Wales by 2-1. Both these teams have only met once, and that was in a friendly back in 2004 in which England thrashed them by 6-1. Iceland has had the least amount of passes in the tournament so far with just 664 passes and has completed 481 with a pass completion rate of 72% having an average possession of 30% and an accuracy of 60%. They have scored four goals in the three matches played out of the 17 shots with an accuracy of 52%. Traustason, Bodvarrson, Bjarnason and Sigurdsson all scored one goal each and are the joint top scorer for the team. Hart, Clyne, Cahill, Smalling, Bertrand, Henderson, Dier, Wilshere, Sturridge, Vardy, Lallana. Halldorsson, Saevarsson, Arnason, Sigurdsson, Skulason, Gudmundson, Gunnarsson, Sigurdsson, Bjarnson, Sigthorsson, Bodvarsson. ENG vs SPA Euro 2016 round of 16 match will start at six p.m. local time (9.30 p.m. IST, five p.m. BST, 12 p.m. ET). India: TV: Sony Six/HD and ESPN/HD. Live Streaming: Sonyliv and ESPN.in. UK and Ireland: TV: BBC One. Live Streaming: BBC iPlayer. Radio: BBC Radio 5 Live. Singapore: TV: Eleven Singapore, ABS-CBN, and Singtel. Live Streaming: Singtel Go. 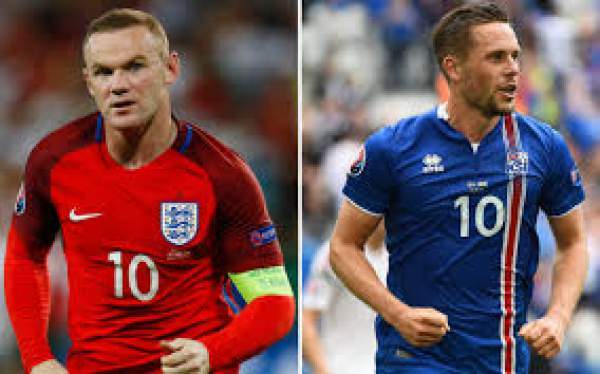 Latin America: TV England vs Iceland Live Score: DirecTV.